Pictures on Page 26 of Volume 77. First picture is original, 2nd is a current/almost remake of the original. First thing you might notice in the original picture is that the Skytroopa looks very, very strange, as if it has a skull for a head. Well that's what I think. 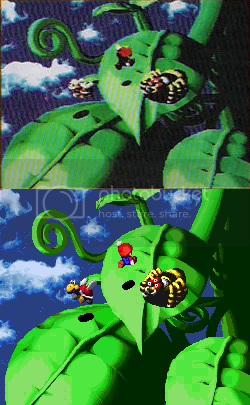 Comparing it with the remake, you can obviously tell it was remodeled for the sprite. Next thing is that you neither fight these enemies with that background. That background is when you fight monsters at Bean Valley climing the beanstalks. Also, the position of Arachne and Skytroopa are off, even if you don't fight them. Probably the first thing to catch your eye is the Chancellor. When they took this picture, they used what is now the Item Shop keeper in the Mushroom Kingdom. Or maybe perhaps this was originally going to be the Chancellor of the Mushroom Kingdom. Maybe his appearence didn't look so friendly or something. 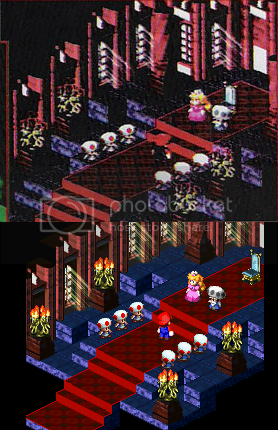 Next, you probably didn't see it right away but the inside of the main room where they are is actually different from the remake picture. Some reason, they redesigned the room a bit. Things that got moved around are the candles, stairs, the ground a bit, windows, pillars, and the chair. Eventually I'll make a replica of the original picture using the final sprite and backgrounds. UGH, this picture drove me CRAZY!!! First off, this layout of the level is not even in the game! The closest I could find was in Bandit's Way. They must have redone the level layout of it or something because there really is no spot that comes close to what that picture shows. Next off is the background. Why is it using the sky background with clouds? It makes the level looks like it's floating. Maybe they were going to have a floating island level or something or maybe they weren't sure what they'd use for the background, which is currently just a solid color. Or it's possible they weren't exactly sure what to use because in the alpha video, they have the background as just a black solid color. Next are the enemies. That Goomba looks so ugly, too brown, and too fat. I'm glad they made it look like now then what it could have been. Then you have the Buzzer (bee) in there. Buzzer doesn't make an appearence until Rose Forest. Next up the Spikey, which is on a teeder-todder for some reason. The only enemies that appear on a teeder-todder is a Bob-omb and a Thwomp and they appear only in Booster's Tower. Finally, they added Treasure Chests I guess to be part of the level.